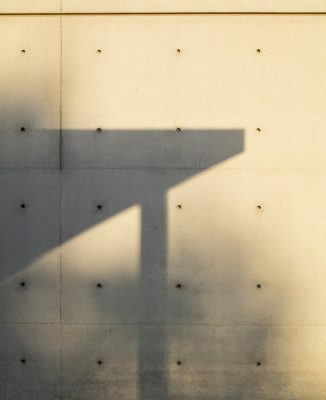 Laid on an 8,000 sqm (20 Acre) plot, two concrete rectangles perpendicular to one another form the letter T. Between them stands a light vertical element. 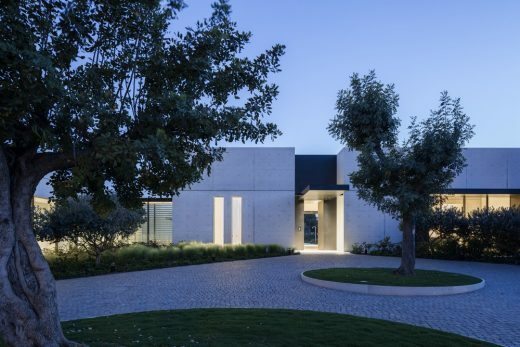 This home was envisioned as an unfolding sequence of simple geometric forms that compose an entire spatial experience. The abundant landscape, including grassland areas and pool, were seen as an integral part of the whole form. 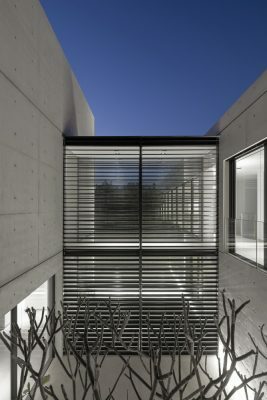 Weaving their way through the concrete structures, they merge the outdoors with the built environment. 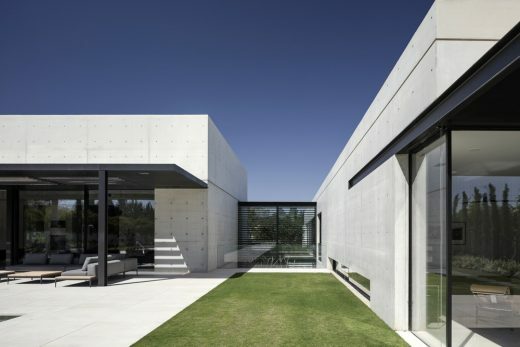 The design plan is minimalist and the material scale is monochrome. 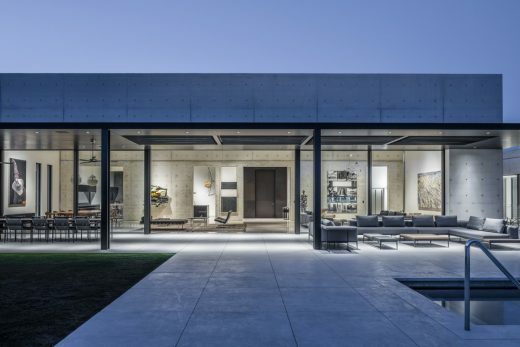 It includes natural stone, exposed concrete and aluminum, all found in varying quantities on the exterior as well as interior of the home. The material and color palettes were greatly restrained so not to overbear the space; allowing the space itself to be an adequate airy platform for the residents and their exquisite art and design collection. 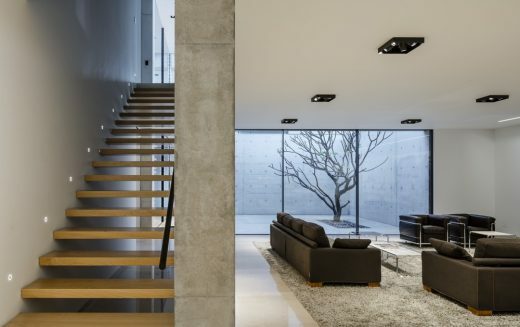 Concrete and white walls combine with large slabs of natural stone flooring. These are strung together by natural wood staircases that delicately stitch the different floors. The prominent color detail found is an array of black. Used throughout in architectural details, such as all the window profiles & outdoor porches as well as in design choices such as the entry door and kitchen façade. Black is used in both wood and metal textures, as those are complementary to the exposed concrete; which serves as the base material in the palette. 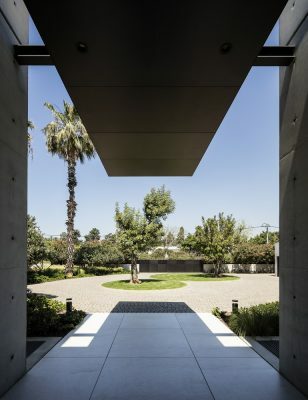 A sculpted circular driveway, allows an encompassing view of the house upon arrival. On this northern, entry façade, elongated slits in the concrete carry-on the buildings geometry and concrete slab layout. They also provide framed views to the interior. 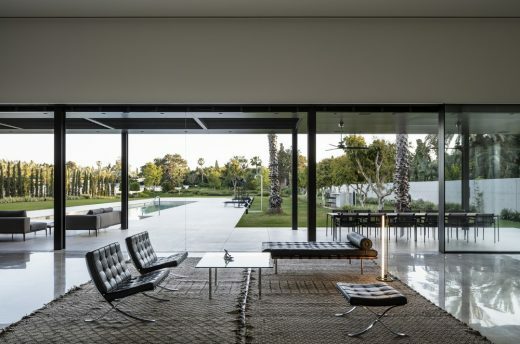 In contrast, the southern façade toward the garden is composed entirely of transparent glass. Allowing a full view to the pool and grounds. The building is divided in two wings. 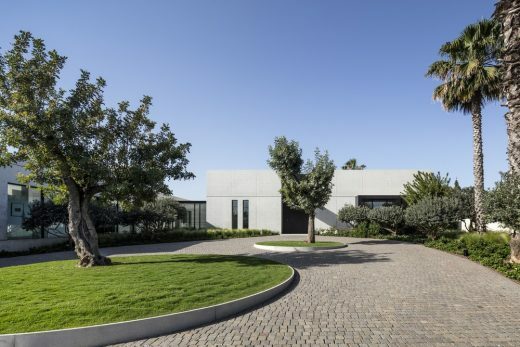 One containing the public zones, including, the entrance, main living, dinning and kitchen areas. The other, houses private functions, including the sleeping quarters and an office. 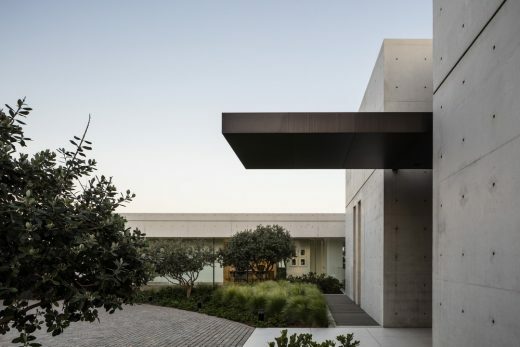 The differing functions of the house characterize the structures – The public wing has monumental proportions in terms of height and volume, thus differentiating itself from the private wing, which has elongated proportions and lesser height for an intimate feeling. 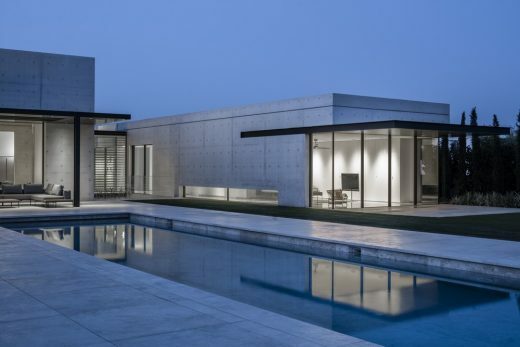 Throughout the day, the structure’s changing reflection is apparent in the elongated pool adjacent to the home. 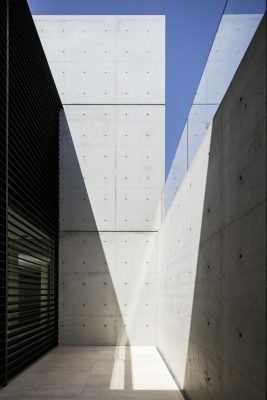 At the core of the public wing runs a 22 meter concrete wall which doubles as a gallery wall for the owners art pieces, and as a divide to the various public functions. It effectively splits the “volume” in two. On one side, the grand living and dining room that lead outdoors to the garden and pool area; on the other, the kitchen with its central island. It is also the supporting wall for downward leading staircase. 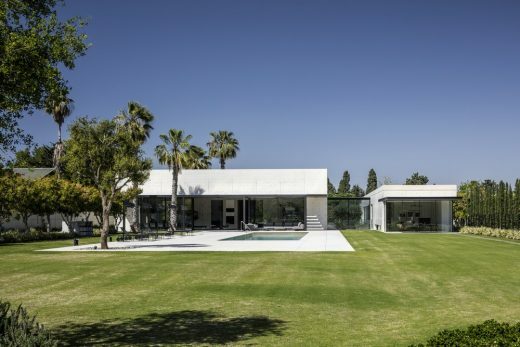 The double height living space is delineated by an 18 meter long, 3 meter tall glass façade that provides a full view to the southern landscape. 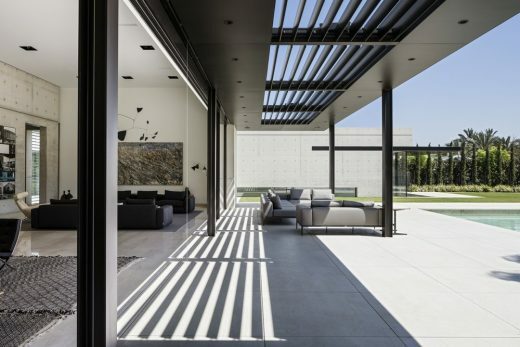 Over the exit, a black aluminum roofed porch emphasizes the horizontal lines of the structure. Conceived by the Japanese space defining word: “engwa”, it is a space that is neither interior nor exterior and at the same time -both. This fully shaded porch provides for comfortable seating year round, and is fitted with adjustable louvers for added comfort. 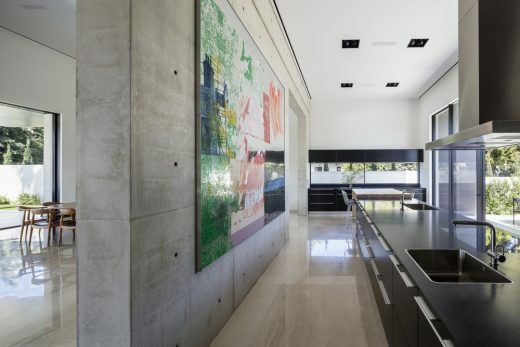 The kitchen, structured around a central island, keeps with the homes elongated & fluid interior proportions. The black kitchen surfaces detailed with aluminum handles, keep with the clean design concept. A framed view of the front yard serves as the opening to an intimate outdoor- eating patio. 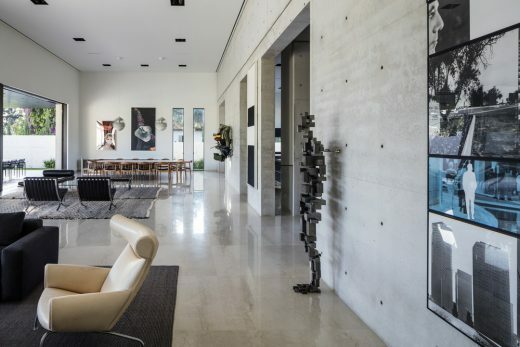 The entire house is of large slab, Italian natural stone flooring. 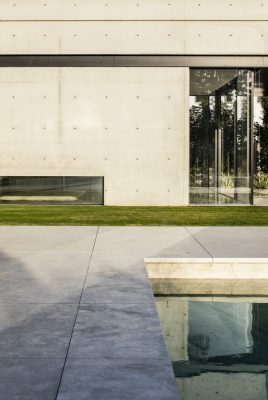 These, complete the clean and quiet look of the inside and spill outward toward the garden, thus blurring the lines between interior and exterior space. Connecting the private and public volumes is a vertical transparent glass element. Trans versing the courtyard, it enables a full view to the gardens, front and back. This element serves as much a transit space as a momentary place for repose. 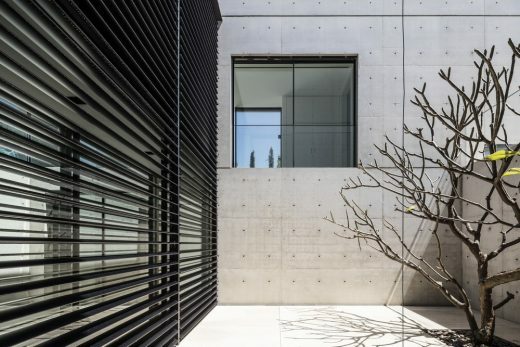 Adjustable louvers screen the Middle East’s abundant sun, providing measured light entry throughout the day. The western, private wing of the home, houses linearly organized bedrooms and a semi-public area. 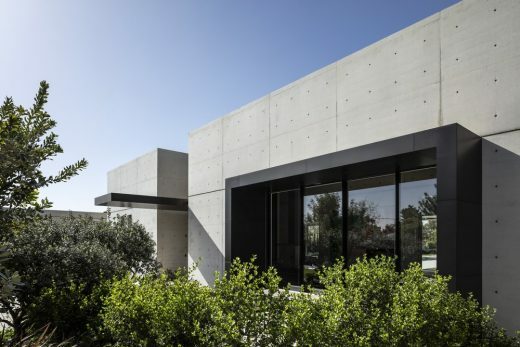 An exposed concrete wall with a single, floor- height slit, separates the master suit from the public space, and provides it a great deal of privacy. The master-suit too uses a restrained color and material palette, in order to complement the space without overbearing. Here too, the focus is southward, toward the grounds, fully visible through a floor to ceiling glass façade. 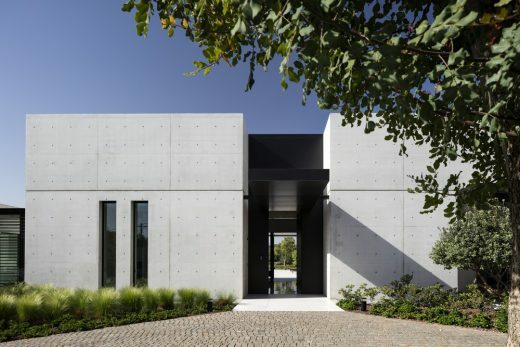 Stretching the length of this architectural volume is a shaded and paved seating area that “spills” from with-in, blurring the boundaries between in and out. The northern part of the private wing houses the guest room and office area. 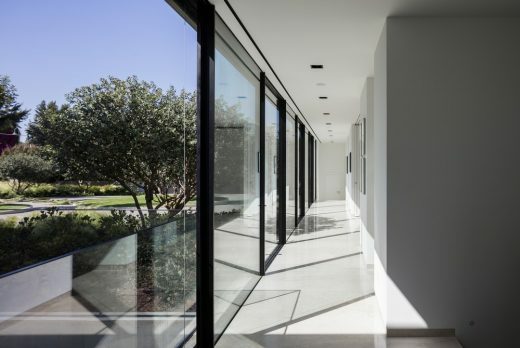 Arranged in a row, these spaces connect via a glass corridor, granting a view to the homes front entrance. Located below the public area of the eastern wing, the basement houses a private screening room, gallery, and an intimate seating area. 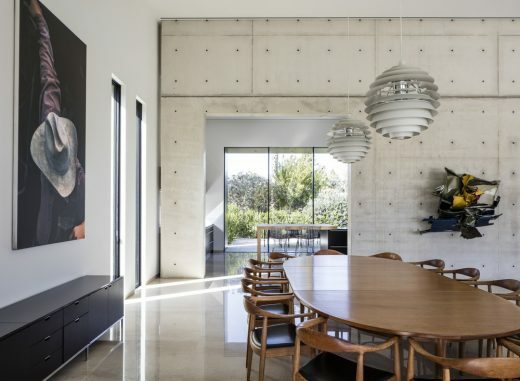 Light fills this space through a dug-in open courtyard, creating both a filter and an added benefit of wonderful light and shadow play on the exposed concrete surfaces. This work is the result of a fruitful dialogue with veteran clients who have vast knowledge and love for art and design. It is the owners’ art and design collection, intertwined with the architecture that creates this homes elegant atmosphere. The long established personal and professional dialogue allowed for a noncompromising planning process. 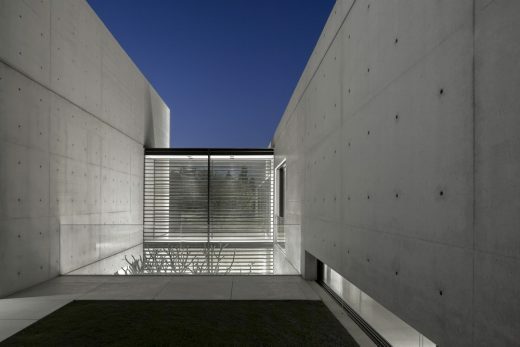 Ultimately allowing the architects to form a strict and clean language, with elements both unique and precise in their purpose. A space that is graceful and un-assuming, open to the outside and giving a stage to the life with-in. Quiet and seemingly effortless. 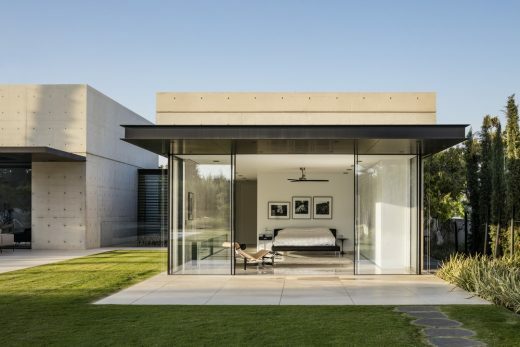 The architects Tal & Chanan de Lange conclude: “Simple design is anything but simple”.